WASHINGTON — In a single tweet, President Donald Trump overturned his own "maximum pressure" campaign against North Korea and publicly undermined his own national security team with a decision to yank back sanctions that his administration had announced only a day before. The official explanation from White House spokeswoman Sarah Sanders — "President Trump likes Chairman Kim and he doesn't think these sanctions will be necessary" — raised more questions than it answered. The White House National Security Council had no comment beyond the one-sentence statement from Sanders. The State Department wouldn't say whether the U.S. was calling off its maximum pressure campaign, referring all questions to the White House. And the Treasury Department had no immediate response on why the policy process broke down and how the sanctions, now already in effect, will be rolled back. "I'm at a loss for words," said David Maxwell, a North Korea expert and retired Army Special Forces colonel now at the Foundation for Defense of Democracies, a hawkish think tank. "It's playing right into Kim Jong Un's hands." Less than 24 hours earlier, senior Trump administration officials had gathered reporters covering North Korea to brief them on the significance of the new sanctions, which targeted two shipping companies accused of evading sanctions on North Korea. The officials emphasized that the U.S. was putting "unprecedented" pressure on North Korea through better sanctions enforcement in hopes of persuading Kim, the North Korean leader, to choose to denuclearize. The officials had warned that North Korea was increasingly evading sanctions, particularly at sea, and put companies worldwide on notice that the U.S. would be watching. They said more companies would be punished if caught evading sanctions on the North. "Everyone should take notice," Trump's national security adviser, John Bolton, wrote Thursday in a tweet promoting the new sanctions. Treasury Secretary Steven Mnuchin added that the U.S. would "continue to enforce our sanctions." Now those threats are likely to fall flat, essentially nullified on Twitter when the president declared "I have today ordered the withdrawal of those additional Sanctions!" As they have before, countries and companies will be forced to make a bet about who to listen to when it comes to U.S. policy: The president, or his senior aides? For Bolton, Secretary of State Mike Pompeo and other top officials, the president's willingness to reverse policies almost immediately after they are announced undercuts their credibility when they work to execute his policies and explain them on the world stage. "There's a question of whether Treasury will be allowed to fully enforce U.S. law against violators," said Bruce Klingner, a former CIA deputy division chief for Korea and a Heritage Foundation scholar. "This was a major mistake." The reversal fits a pattern that has played out repeatedly throughout Trump's presidency. In his first year, only an hour after former Secretary of State Rex Tillerson voiced support for Qatar in its dispute with its Arab Gulf neighbors, Trump appeared in the Rose Garden and took the opposite side in the spat. During the government shutdown in January, Trump undercut Vice President Mike Pence by rejecting the very deal Pence was trying to sell in Congress. And top Trump aides were so distraught over his announcement on Twitter that the U.S. was withdrawing from Syria, despite repeated assurances that it would keep troops there to fight Iran and prevent extremists from regrouping, that some of them resigned. National security analysts said pulling back on North Korea sanctions is particularly perplexing given that the economic pressure campaign is the element of Trump's approach that has actually worked, bringing Kim to the table twice for unprecedented talks with a U.S. president. 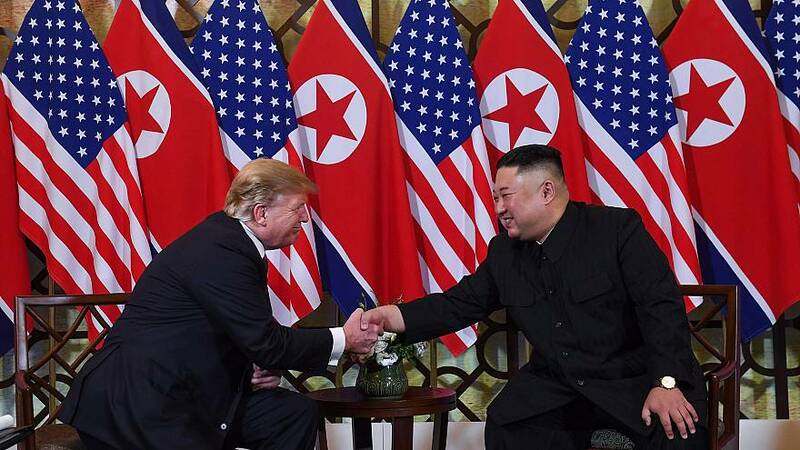 The goal of those talks is a deal to rid North Korea of nuclear weapons, but the last summit in Hanoi last month ended without an agreement, with Trump saying the North simply wasn't willing to concede enough on denuclearization. Trump had refused Kim's request that the U.S. start easing sanctions immediately in exchange for only a partial destruction of Pyongyang's nuclear program, officials said at the time. "We should have learned from Hanoi that maximum pressure is achieving an effect, because it's the one demand that Kim Jong Un has made," said Maxwell, who formerly served on the United States Forces Korea planning staff. "He doesn't care about an end of war declaration, exchange of liaisons. He wants sanctions lifted." So what has changed? Rather than leaning in further to peace and denuclearization efforts since Hanoi, North Korea has been leaning away. Hours before Trump's tweet on the sanctions, North Korea said it was withdrawing from its joint liaison office with South Korea, a decision that Seoul called "regrettable." And not only has the North not dismantled its nuclear sites, but only two days after the Hanoi summit collapsed, the country started pursuing the "rapid rebuilding" of the long-range rocket site at Sohae Launch Facility, NBC News reported in early March, in a sign that North Korea was in fact working to advance its intercontinental ballistic missiles program. The key factor, according to the White House's explanation, is Trump's personal affection for the North Korean dictator, whom Trump's own State Department accuses of gross human rights violations. Trump's willingness to give the benefit of the doubt to foreign leaders based on a personal bond has been on display before. In his dealings with Russian President Vladimir Putin, Saudi Crown Prince Mohammed bin Salman and Philippine President Rodgrigo Duterte, Trump has relied on his own instincts and sense of a warm personal relationship rather than U.S. intelligence assessments or the advice of his top advisers.